s long time ago, in the city of Boston, there lived a small girl who had the naughty habit of running away. On a certain April morning, almost as soon as her mother finished buttoning her dress, Louisa May Alcott slipped out of the house and up the street as fast as her feet could carry her. When the runaway woke up and heard what the man was shouting--"Lost--Lost--A little girl, six years old, in a pink frock, white hat, and new, green shoes"--she called out in the darkness: "Why--dat's ME!" Except for this one fault, Louisa was a good child, so she felt much ashamed that she had caused her mother, whom she loved dearly, so much worry. As she sat there, tied to the sofa, she made up her mind that she would never frighten her so again. No--she would cure herself of the running-away habit! After that day, whenever she felt the least desire to slip out of the house without asking permission, she would hurry to her own little room and shut the door tight. To keep her mind from bad plans she would shut her eyes and make up stories--think them all out, herself, you know. Then, when some of them seemed pretty good, she would write them down so that she would not forget them. By and by she found she liked making stories better than anything she had ever done in her life. It was soon after her return home that her books began to sell so well that she found herself, for the first time in her life, with a great deal of money. There was enough to buy luxuries for the Alcott family--there was enough for her to travel. 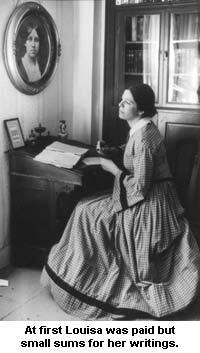 No doubt she got more happiness in traveling than some people, for she found boys and girls in England, France, and Germany reading the very books she herself, Louisa May Alcott, had written. Then, too, at the age of fifty, she enjoyed venturing into new places just as well as she did the morning she sallied forth to Boston Common in her new green shoes!